Today I remember September 11, 2001. It forever changed the way we think and live as American Citizens. View An Extremely Powerful Retrospective with Music and Incredible Photographs. It is dedicated to those who lost their lives and to all the heroes that responded. *A Cautionary Note: Because of the length and strong emotional content, a special time and tissues are advised. ~ ~ ~ ~ ~ ~ ~ ~ Lets all think thoughts of love and peace. 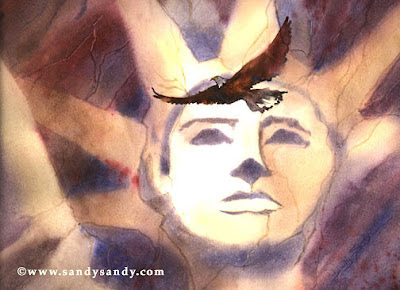 beautiful new painting, Sandy. the October issue of Watercolor Artist devotes much of the issue to works on YUPO. if you don't have it, I'll try to scan an article over to you. hope you're enjoying this refreshing weather! Thanks for the comment, Carmella. Yes, I'd be interested in seeing that article on painting on Yupo and YES, I love this weather, don't you?! Very moving painting Sandy. I may or may not watch the link. It is difficult and sometimes not always up for the images.